Hockey tournaments have been in the Harrington family since 1972. Throughout the years and into the future Showdown Tournaments promises to make each teams experience fun and competitive. We realize that teams have many different choices and the selection process can be overwhelming, but at Showdown Tournaments quality ranks first. Over the years we have developed sophisticated processes and methods for screening applicants, building tournament divisions, scheduling, communicating, and handling logistical aspects. The list below represents our top priorities, and factors you should consider when making your tournament choice. Showdown Tournaments has learned over the years that keeping the tournaments well organized makes it easier and fun for everyone. Showdown Tournaments begins to organize your team’s tournament experience the day it receives your application. Showdown Tournaments performs a multitude of tasks to make the tournament well organized and your tournament experience unforgettable. Some of those task include conducting a comprehensive screening process, reviewing player eligibility, securing hotel arrangements, scheduling USA certified referees, creating a convenient game schedule, organizing experience staff, preparing a tournament guide, and much more. At the tournament, teams seldom have questions since everything has been well planned out before your team’s arrival. Registration will be your main responsibility where team coaches, managers, and players sign in to validate participation. Registration will only take a few minutes of your time and then your team can relax and enjoy themselves. A well organized tournament really begins with placing teams into well-balanced and competitive divisions. Showdown Tournaments takes ever effort to ensure it understands each team’s level of play within and outside of its league. Competitive classification systems (AA, A, B, C, House Select) vary or have different meanings across the country. Because of this variance your team will encounter teams that may have different eligibility rules or classification systems that may not necessarily correspond to what you are accustomed to in your particular area. This is the reason for conducting a comprehensive screening process to ensure proper team placement. This process takes countless hours, but the results are very rewarding! Showdown Tournaments issues a final game schedule once it has completed the team placement process. This occurs about two to three weeks prior to the tournament to ensure each team has adequate time to plan their hockey and extracurricular activities. 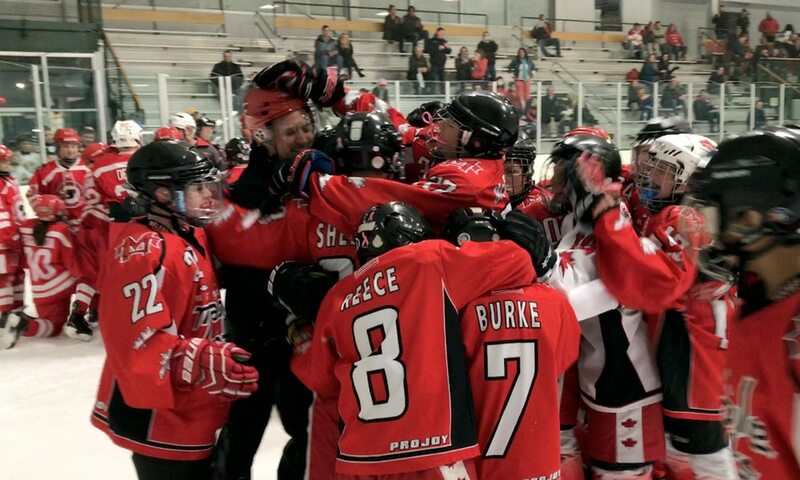 Schedules seldom change as Showdown Tournaments uses a rigorous validation process before issuing the schedule to the teams, rinks, and referees. We consider travel distance, time gaps between games, and distribution of morning, afternoon, and evening games. Showdown Tournaments provides experienced and knowledgeable staff at each rink for registering teams, scorekeeping games, conducting special events like the Showdown Olympics and Pin Exchange, tracking scores and team placement, and to answer general tournament questions. Each rink has a head tournament director present to address specific tournament questions and any issues that may arise during the tournament. Showdown tournaments must use referees certified and trained under USA Hockey and affiliated with a local referee association. The head referee chooses from level 1, 2, 3 and 4 referees and matches them to the appropriate age groups and levels. Showdown Tournament relies upon referees to provide coaches official answer to questions regarding rules of play. We stand behind all referee decisions meaning the tournament directors will not overrule the referee’s decision! Showdown Tournaments selects the most convenient and well run rinks in the area to host our tournaments. Well managed rinks play a key role in keeping the tournaments running on time and providing clean and safe environments to host our activities. Every rink used by Showdown Tournaments has warming facilities, a snack bar, a pro shop, and plenty of parking. Information about each rink is available on our website. Showdown Tournaments secures hotel accommodations for all out of town guests at the best locations in the area at affordable rates. The hotels are conveniently located to all of the rinks and have a multitude of restaurants and shopping centers at your convenience. It’s imperative that you understand that each host hotel supports the cost of the tournament. Absent their support there would be no tournament! In return for their support, all of our guests stay at the host hotels at a discounted group rate. Showdown Tournaments provides all players two fun filled events outside regular games. We encourage all teams to participate in the Showdown Olympics and Pin Exchange to make the most of your tournament experience. The Showdown Olympics has been a highlight at each Showdown Tournament with many great memories for all the teams. It offers a unique experience for team building while having fun. The competition is organized to allow each player on every team to participate in at least one event. The Showdown Olympic events provide teams with a less serious atmosphere and designed to be team spirited. The Pin Exchange is a great opportunity for teams to trade or exchange pins or other keepsakes with other teams. It also provides the opportunity to engage in off-ice conversation and make new friends. Each player participating in the tournament receives a unique souvenir to hold onto their tournament memories for years to come. Each team advancing to the championship game receives individual trophies and the championship team receives a banner to put on display for everyone to see at their home rink. At the Showdown Olympics players receive customized gold, silver, and bronze medals for first, second, and third place.